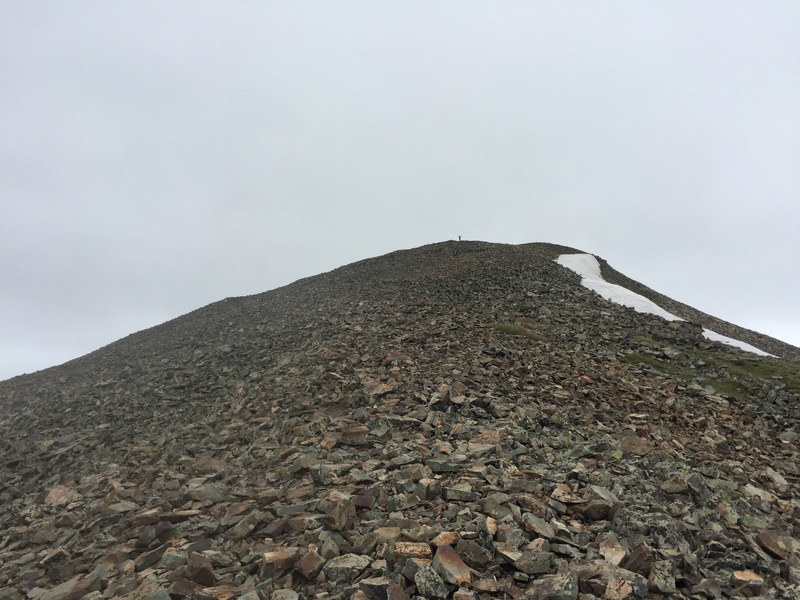 Our trip to Colorado was spawned from two things, a dream that Dominic had of hiking to the summit of a mountain and an idea that Steve had. Once those two things happened we got the trip planned to accomplish that goal. Long story short, Dominic reached the summit of the mountain! Great job knocking one off of your dream list Bud, I’m super proud of you!!! Sometimes the coolest experiences in life come as the result of a mistake. That was the case for us today. On our way to our hike we ended up missing our turn and didn’t realize it until almost an hour later. Once we realized what had happened we had two choices. Go back from where we came, or take the road less travelled. Never ones to conform we took the latter and never stressed for a second. After a short time going on a normal highway we took our new route, the one that involved gravel, almost no traffic, a lack of shoulders, steep drops, and awesome views. It may not have been the way we initially planned, but it turned out pretty sweet! By the time it was all said and done we made it to our destination and enjoyed an incredible end of our hike. Sometimes we don’t end up going the way we’ve planned. Sometimes we make a mistake and go the wrong way. The cool thing is that once we realize it we can correct and get back to where we meant to go. Even cooler is the fact that if we stay open minded we might end up taking an even more fantastic route than what we’d imagined. I’m very thankful for that today! At Scout Camp this week one of the counsellors, another dad, and I all put our heads together and were working on putting together the framework for a new version of Scouting for adults… Man Scouts! In this new endeavor instead of working towards our Eagle we work towards our Geezer badge. To get there we have to earn many merit badges including Comic Book Collecting, Chainsaw Juggling, Blindfolded Lion Taming, Scotch, and many other wonderful things that us old dudes like to do. Tonight Steve and I helped the boys start to earn their own merit badges before adulthood… Poker and Survival Kits. Poker consisted of watching the World Series of Poker Final Table and walking them through the percentages, strategies, and so on. 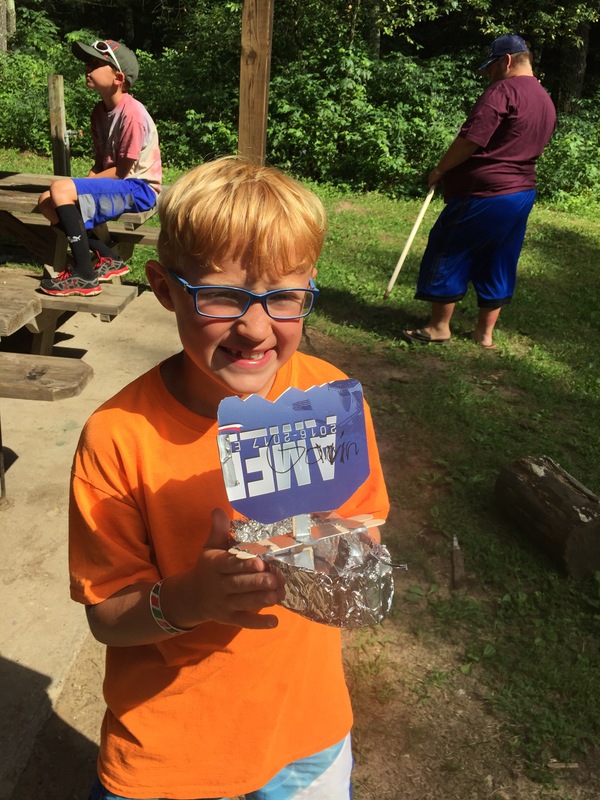 Survival Kits was taught by Steve as he walked the boys through their new survival kits designed specifically by Steve for the boys! Knowing that they’re already earning their way to their first Man Scouts Merit Badges makes me smile. Who cares if the badges are real or not, it was a great time helping them learn some new skills. For that I’m thankful! Isn’t it funny how life sometimes lines everything up just right for us to see? Those moments when The Big Guy Upstairs makes it so easy that we can’t help but trip on what He’s trying to show us. Much of Scout Camp led to one moment that touched me so deeply that I was moved to happy tears. The day that Gavin made his comment about me always being his buddy was one of the best days of being a dad that I’ve ever had. In addition to the comment it was an amazing day that I’ll hold precious for all of my life. We had so much fun, the three of us, it was fantastic father son time. In between the comment and kayaking there were many other things we did together that led to that moment I’ll hold in my heart. In the afternoon we went to the handicraft area to work on Gavin’s viking ship. While he was doing that Dominic decided to do some leather stamping. I’d had an idea earlier so I had brought along the leather knife belt sheath kit I’d picked up earlier in the day. Once Dominic was done I asked him to put a particular design on my case to remind me of this trip. He smiled from ear to ear and was happy to do it. Once completed he asked me if I’d like to have him do more to decorate it and I told him to do whatever he felt was appropriate. For me the most important part was already there… an intermingling of our three sets of initials and the year. 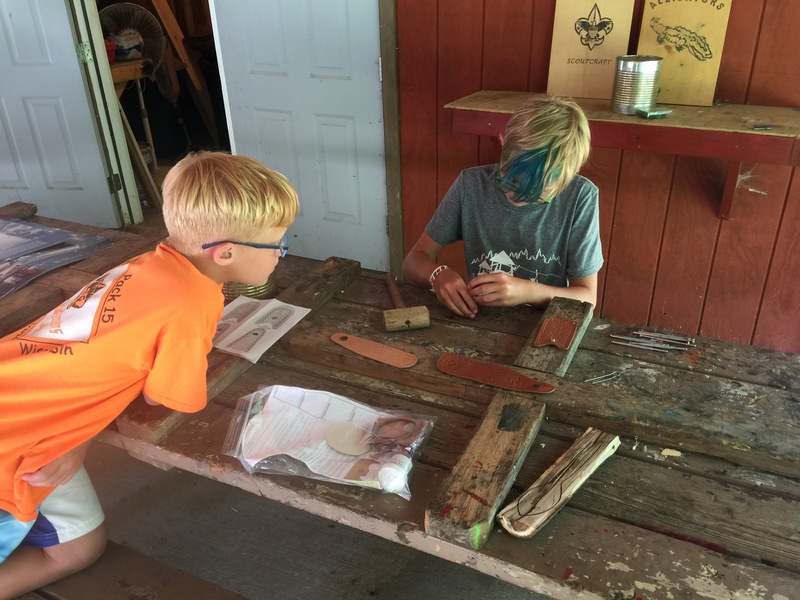 After Gavin had finished his ship he wanted to leather stamp his knife case, but the instructor said that only Boy Scouts who’d completed the Leatherwork merit badge could use the equipment. Understanding the reasons Gavin asked Dominic to decorate it for him. I then spent the next fifteen minutes watching Dominic work the leather under the instruction of Gavin. They shared ideas, worked as a team, and ended up with an incredible piece of work. As Gavin told Dominic, “you made it look even better than the picture on the box!” Sitting back and seeing he two of them work together left me smiling. After that we went to camp, met as a den, went to dinner, and then got ready for the pool party. 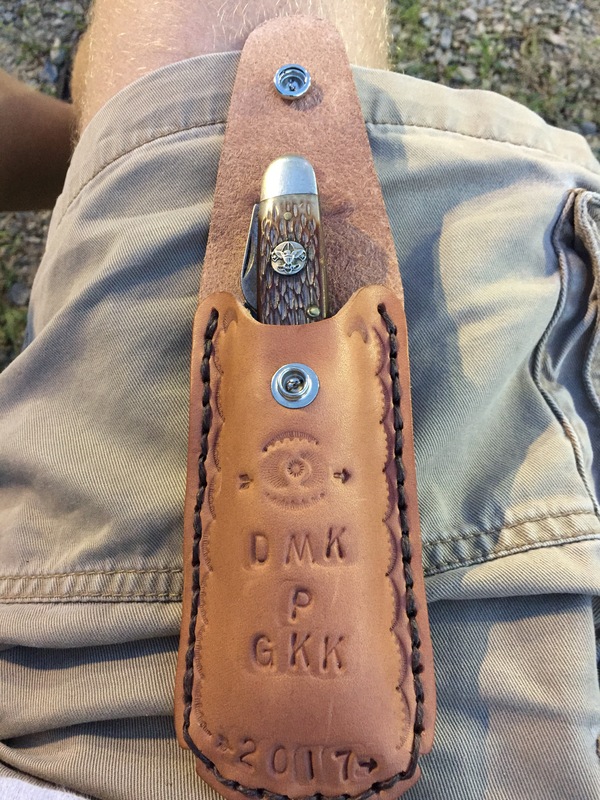 Not wanting to miss it, but knowing that the boys didn’t need Dad right with them I brought my unfinished knife sheath to the poolside and proceeded to put it together as I sat in a chair watching he boys and smiling at the sound of their laughter. While putting it together I bought of Dad a lot. I remembered my experiences at camp with him, I thought of him showing the boys how to do wood burning, and remembered stories of him doing crafts when he was younger. As I ran the needle and thread through the stamped leather I kept thinking of him smiling as he watched me (both his smile of pride and his smile of “you dumbass” as I screwed up a simple part because I wasn’t paying attention!). As I was working on it I had to cut the string to size. What tool did I use? The only one that felt appropriate, the Boy Scout knife I’d received from Grandpa Kreiling many years ago (I blogged about it last year). Something about using it and thinking of Grandpa just felt right as I finished up I was listening to the boys have fun and felt the immense pride of being their dad. And that’s when the moment hit me. 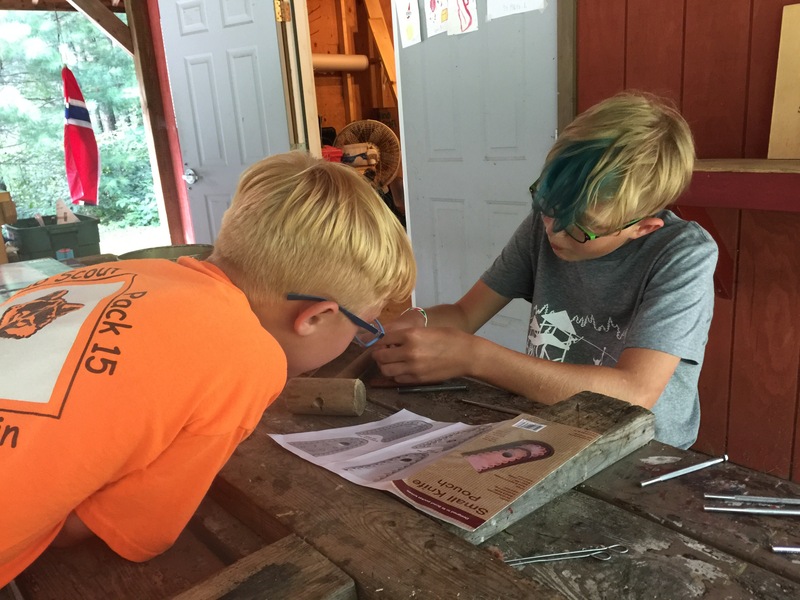 I looked down as I slid the knife from Grandpa into the finished project created by my boys and I as I thought of my dad… I saw the finished project, I saw my boys playing, and I saw Dad and Grandpa together and smiling with pride standing next to me. I saw that all, and I cried tears of happiness. Full disclosure, I’m tired, stiff, sore, and it feels GREAT!!! 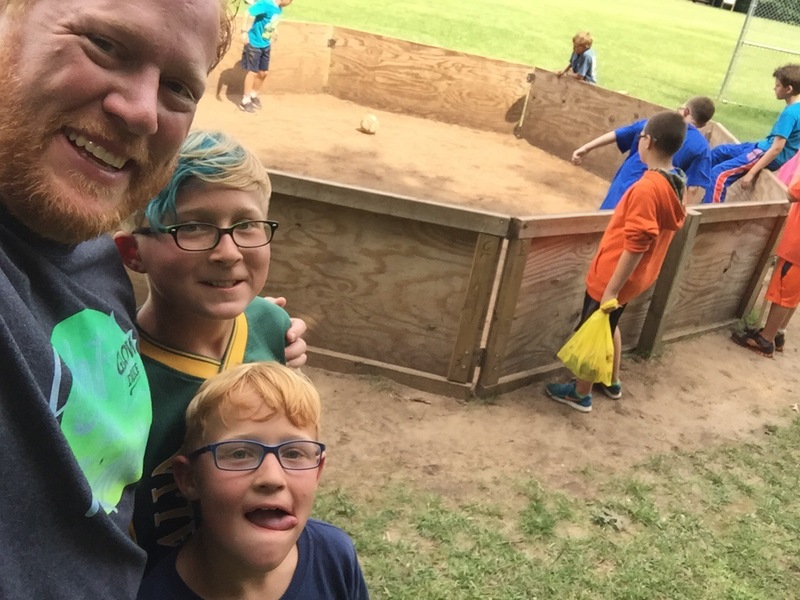 Earlier in the day Gavin’s desire to go up the climbing wall was thwarted due to the wood being wet so we went off to his Plan B, the GaGa Ball Pit! If you haven’t experience the game before it’s a great way to entertain kids for hours. 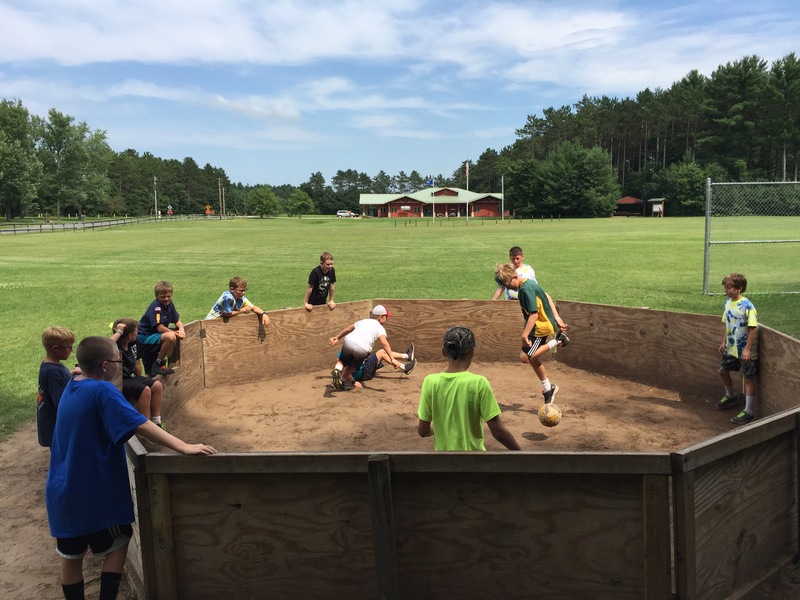 It’s a sport played in a plywood octagon by 20+ kids (& the occasional adult) at one time. It’s made of 8′ long sheets of plywood. Using a volleyball you hit it with your hand and attempt to hit an opponent in the knee or lower without being hit there first. last man standing wins. The ball is constantly moving, the kids are all screaming and it’s as close to organized chaos as you can get in an organized event. After watching a couple of games and being asked to play repeatedly by Gavin I jumped in and was more than three times the age of the oldest kid. Jumping, diving, movin’ and groovin’. It was so much fun!!! Somehow I even ended up winning a game! I could careless about winning, but it was pretty cool to see Gavin, Dominic and I each win a game – a Kreiling sweep (that said, we did play 20+ games!). Before I knew it almost two hours had passed and I was sweaty, giggling, and having a blast! Between all the fun, some Scout values lessons, making new friends, & hanging out with my boys I had so much fun!!! I’m sure that I’ll pay for it tomorrow, but for today I enjoyed every second of it! Thanks for inviting me to play boys, that was awesome!!! Scout Camp was pretty awesome today. The activities have been a lot of fun, but they don’t have anything on a comment that Gavin made today that still has me smiling several hours later. At one point it was Gavin, Dominic & I were all partnered up and paddling in kayaks at the pond. When we’d decided to move on to a new activity the three of us started walking back through camp. Knowing that Gavin also likes his independence I told him that if he ever wanted to not have me be his buddy (we use the buddy system at camp) I was okay with that and my feelings would not be hurt. His head turned and he had a very confused look on his face. “Why would I ever want you to not be my buddy and be with me?” He was incredulous and couldn’t understand why I’d ever think that was a legit idea. My heart melted and I had to fight hard to keep the awesome from leaking out of my eyes. Bud, thanks for reminding me yet again that best-est buddies will always be best-est buddies. I can’t begin to tell you how much I appreciate this opportunity to experience Scout Camp with you. You’ve reminded me of so many memories I have with my dad while creating so many new memories with you and Dominic. Love you tons Bud!! !